Catching our breath, clapping our hands, and making room to display not one but TWO big awards received this month. 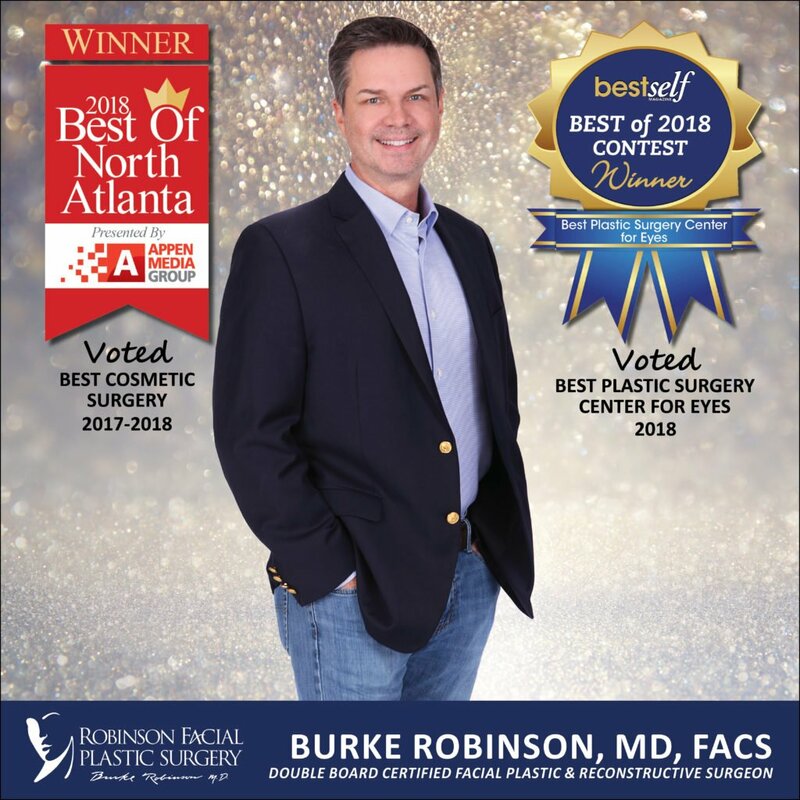 The Appen Media Group tapped Dr. Burke Robinson, FACS, as “BEST COSMETIC SURGERY” in their 2018 Best of North Atlanta Awards (2nd Year in a Row), and Best Self Atlanta Magazine named us as “BEST PLASTIC SURGERY CENTER FOR EYES” in their Best of 2018 Contest. Dr. Robinson and our entire Robinson Facial Plastic Surgery team have been honored by these incredible recognitions for our work. The structures of the face demand the care of a skilled plastic surgeon, rigorously trained and singularly focused on facial procedures. With over 25 years of experience, Dr. Robinson takes an artisan approach to revitalize the face with natural-looking results, an approach that gives his patients a new self-confidence projecting to the outside the way they feel on the inside. Known for his genuine compassion and deep commitment to providing the utmost in surgical care, safety, and results, Dr. Robinson remains one of the most trusted cosmetic surgeons in the area. As the most visible and expressive part of the human body, the face often serves as an outward expression of inner personality and character. Unfortunately, a number of natural factors, including age, stress, and exposure to the elements can cause subtle changes that gradually take a toll on facial aesthetics. When it comes to the eyes, the delicate tissue may reflect the years more quickly than other areas of the face, requiring either non-surgical enhancement or minor surgical intervention. Dr. Robinson’s skilled techniques determine the most effective solutions for high-impact results — some candidates may even be eligible for in-office eyelid surgery that precludes anesthesia or a trip to the OR. Dr. Robinson, an award-winning, Double Board Certified Facial Plastic and Reconstructive Surgeon, founded this practice with a singular mission to use his professional expertise to guide his cherished clients toward realizing their own dreams for healthy change. Robinson Facial Plastic Surgery and Visage Skin Care Center offer a full range of the most advanced facial surgical procedures; as well as, non-surgical facial rejuvenation treatments with cosmetic fillers, laser treatments, peels, microneedling, and VISIA skin care evaluation with medical-grade skin care regimen recommendation. It’s a great time to think about looking your best, and the RFPS team welcome questions. Contact us at 770-667-3090 for more information and to make an appointment for a consultation with any of our experienced providers.